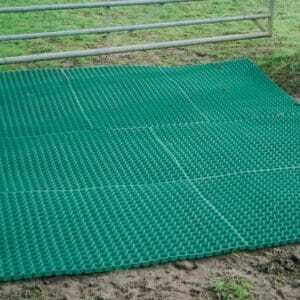 With a 22% greater footprint and being harder than standard mats, they are extremely tough and long lasting, and cope better with constant vehicle usage in less muddy conditions, or where sub-strata conditions are bad for animals. They are available in one size; in black or brown. Note: These mats are supplied with free pins and (black) ties. 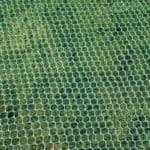 These heavy honeycomb grass mats are a series of holes surrounded by fully vulcanized latex. If laid on grass, dependant on weather, they are amenable to all heavy animals and irregular vehicle use up to 4 tons. Laid on hard sub-strata, or the M9 mesh, they can withstand all normal vehicles in all weather conditions. The mats are 1.50m x 1.00m x 23mm thick (4′ 11″ x 3′ 3″) and conform to BS EN 1177:88 with a critical fall height of 2.5m. Being flexible, they rely on grass roots to support them, while, in turn, they protect the roots from depredation from sharp hooves. This means they will be less effective if laid onto deep mud. They should either be laid when the ground is able to support them, or use the M9 mesh as a stabilising agent when used to cover deep mud areas and gateways. They work as well on light mud, but will still appear to sink. However, the mud will get no worse with the covered area remaining flat. For regular vehicle use on anything other than a hard sub-stratum, it is imperative to use the M9 mesh. 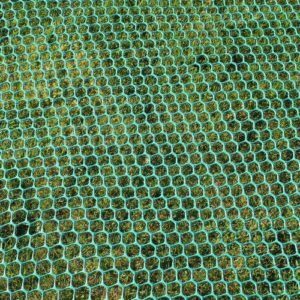 They are also known as grass mats, hollow mats, holey mats or ring mats. 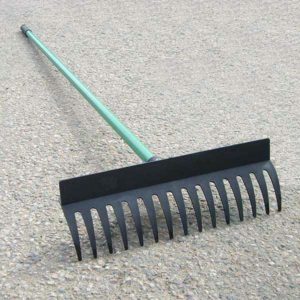 They are suitable for grass protection and outstanding at gravel containment. 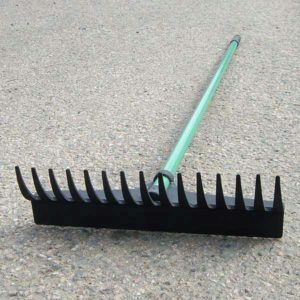 They can be laid on any surface with no prior ground work required, bar smoothing rough soil and, due to their size and weight, are ideal in very muddy gateways, fields, heavily used paths, child play areas, Schools, Colleges and Universities, driveways, car and caravan parking areas, or anywhere outside subjected to constant heavy usage. Please note that after a few years, the brown honeycomb mats may appear to be perishing. This is caused by the latex and the pigment weathering at different rates. This does not impair the durability of the mats in any way.